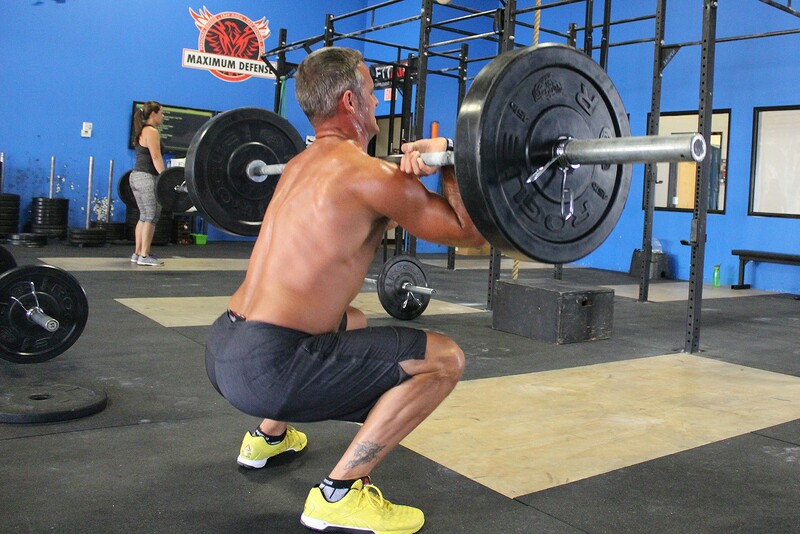 MESA – It’s 9:15 a.m. on a Tuesday afternoon, and Britt Burns is teaching his fourth CrossFit session of the morning. He spends time with each of the 20 members as they stretch, practice lifting weights and jumping onto boxes. His gym, CrossFit Incite, is one of several gyms in the Valley that are certified to be affiliated with the CrossFit program. Burns isn’t alone. As of June 2014, CrossFit had 10,000 affiliated gyms around the world offering its brand of exercise: a mixture of high-intensity interval training, power lifting, speed exercises, gymnastics and more to achieve, as its website states, a broad and general level of fitness. But over the last few years, CrossFit has faced negative headlines noting that the strenuous workout has left some participants with muscle, bone and ligament injuries and questioning the practicality and safety of the program. Scott Onyett, a firefighter for Chandler Fire, Health and Medical who has been a CrossFit member since 2007, said the high-intensity workout isn’t for everyone. To Onyett, there’s a fine line between pushing yourself to your limit and letting your ego take a hold of you. Burns, also a firefighter by trade, said one of the biggest reasons for injuries is the rapidly growing number of gyms and the relative ease of becoming an affiliate. CrossFit workouts differ from gym to gym, with some being more intense than others, but the Workout of the Day can include running, kettlebells, deadlifts, pushups, pullups, situps, squats, bench presses and more. These workouts are usually done in cycles with a mixture of strength conditioning and cardiovascular. A firefighter for 16 years and CrossFit member for seven, Burns said this kind of workout helps with his job as a first responder. As a trainer, however, his gym is filled with all kinds of people. Burns said this modification falls on personal responsibility or on the coach’s judgment, but if the coaches are inexperienced or aren’t monitoring the members for volume of lifts, injury can occur. Erin Harper, an exercise science and health promotion instructor at Arizona State University, said people gravitate toward CrossFit because they can spend less time exercising and get positive results. “There is research to show that you can have equal or greater gains in terms of things that we would measure for cardiovascular health like left ventricular mass (heart size) or maximal oxygen updates,” she said. In terms of cardiovascular health, the benefits of high intensity interval training and short-duration workouts are well-documented by the American College of Sports Medicine. 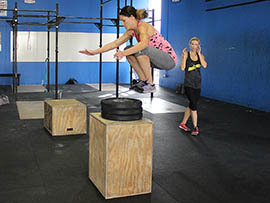 A CrossFit member herself, Harper also said that the popularity of CrossFit could be linked to the injury rates. A 2013 study by the Journal of Strength and Conditioning Research found a rate of 3.1 injuries per 1,000 hours in a sample of 132 CrossFit members. Harper said that rate is no reason for alarm. “I can compare that to other sports … these rates are the same with weightlifting, powerlifting, gymnastics, and is still less than contact sports like football or rugby,” she said. Kristin Hoffmer, a senior lecturer with ASU’s exercise science and health promotion program and a CrossFit member, specializes in the psychology behind exercise. She said CrossFit’s popularity and rise in injuries can be explained by mental needs that the workout satisfies. “Mentally, it keeps a lot of people coming back,” she added. 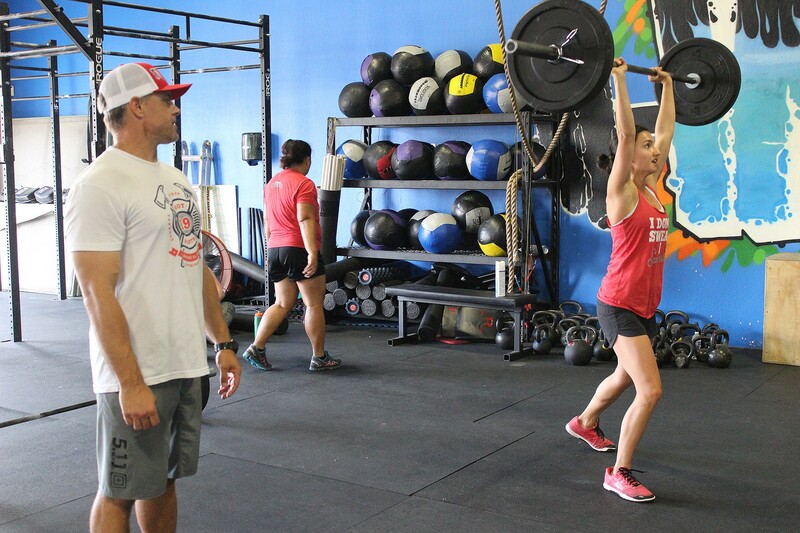 Hoffmer, Harper and Burns acknowledged Crossfit’s creation of a workout community, driving people to improve both on a personal level and as a group. But Burns said community can also lead to a sense of competitiveness in gyms that could lead to injuries. Hoffmer said that the drive for improvement is the heart of CrossFit, adding that the debate over its injury rates has gotten out of hand. “Injuries are a part of being active. Who cares?” she said. “It bothers me that there’s a competition among people’s exercise choices now. 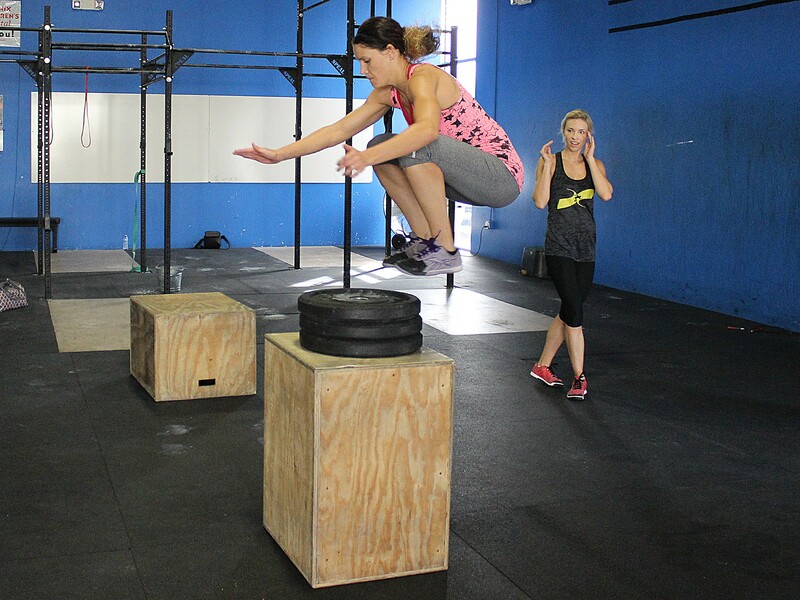 A CrossFit Incite member executes a box jump, a typical CrossFit exercise, at the gym in Mesa. 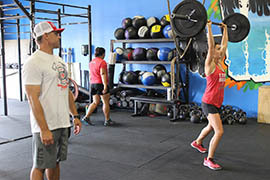 CrossFit Incite trainer Britt Burns monitors a member practicing a clean-and-jerk weight lift. A CrossFit Incite member practices a clean weight lift.